I am obsessed with this shade of blue, aren't I? I have posted here about cute knits and quilts, and things that came out just the way I wanted, and some things that came out surprisingly better than expected. Not today. 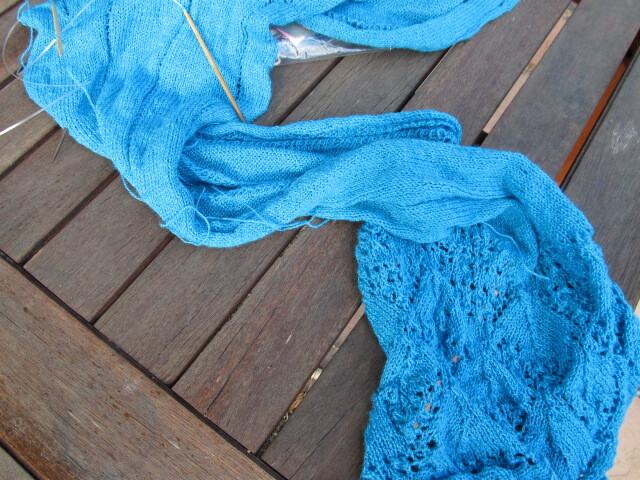 Back in May, I started a shawl, using a pattern from “Knitting in the Sun” The idea is, you knit one lacy end, then knit toward the middle, then knit another lacy end, knit to the middle, then graft them together. The pattern was a stretch for me, the lace pattern was pretty complicated, but there was a nice boring part in the middle that I could do while watching TV. I figured I could get it done by the middle of June or so, since I had a fancy wedding to go to, where a bright lacy shawl would be a great accessory. The first lace end was sloppy, I had to rip back a few times. I found I could not talk or even listen to conversations when I worked on it- I could only work on it during the times when the kids were out of the house and the TV was off. This slowed down my production. The second lace end was better, but not by much. There are sloppy parts, but not bad enough to rip back, so the sloppiness is forever enshrined in yarn. I want to emphasize that there is nothing wrong with the pattern itself-just my knitting skills. I don’t do lace very well, and a pattern where I have to memorize a different set of numbers for each row just doesn’t work for me. I would do few rows, then put it away again in its ziplock bag.With no deadline, there was no push to finish. Somewhere along the way I lost count of stitches, then discovered the error and got back on track, so the rows of eyelets are crooked, like a goat path. 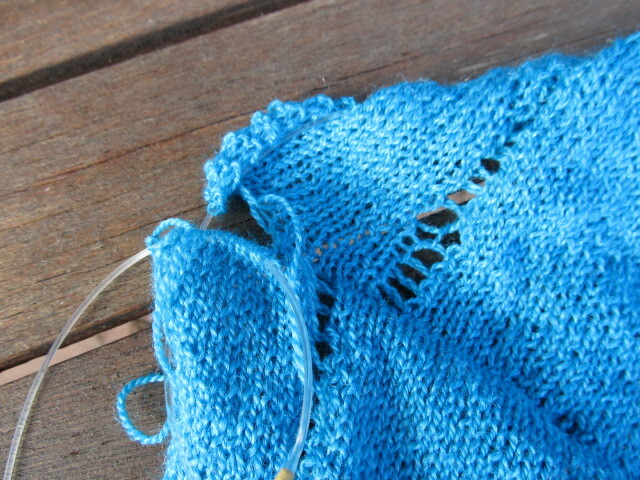 Or how I imagine a goat path might be, if it were knitted into a shawl, in Cyan colored wool and silk. In getting back on track, I added stitches, so one side is 6 stitches wider than the other, where they are supposed to meet in the middle. I found this out, not by counting, that would be too easy. You can see where the graft, which is supposed to be invisible, is, well, visible, and where I am half a dozen stitches off. I found this out by actually grafting them together, a process so fraught with stress, that when I do it on the toes of socks, I insist on absolute silence from my children. It took me about half n hour, and when I got to the end, and realized I had extra stitches and no way I could think of to fix them, I nearly cried. I balled the shawl up and shoved it in the ziplock bag. I still haven’t decided what to do- I have a little yarn left, so I could go backwards, even out the stitches, rejoin. If I wear it as a scarf, under the collar of my black coat, the sloppy join wouldn’t show a whole lot. Here is the challenge of a blog- and maybe life. Not everything I do is perfect. I get frozen by perfectionism from time to time, not wanting to take a risk because everyone will find out what a fraud I am (fraud, not frog. )But if I never take a risk, I’ll never get better. But do I always have to be getting better? What’s wrong with a little stagnation going into fall? So anyway, I’m not sure how to fix this disaster, or if I even want to at this point. I really love the color, and the feel of the yarn, but I can’t face working on it right now. Time for another sock, maybe. What are your thoughts?